Lean beef can be a bore sometimes. But put it on a stick with a delicious marinade and you've totally changed the game! Layers of meat, red and green peppers, and onion create a delicious meal you'll want to make again and again. Serve these with rice or potatoes, and make a few extra to have as leftovers for lunch tomorrow! Mince the garlic cloves and mix them into the olive oil. Add lemon juice to the olive oil and garlic mixture, followed by the oregano and rosemary. Slice the lean beef into small chunks. Chop the bell peppers and onion into small squares and toss into a large bowl with the lean beef. Pour the marinade into the veggie and beef bowl and mix with a fork until fully coated. Let marinate in the refrigerator for 2-3 hours. 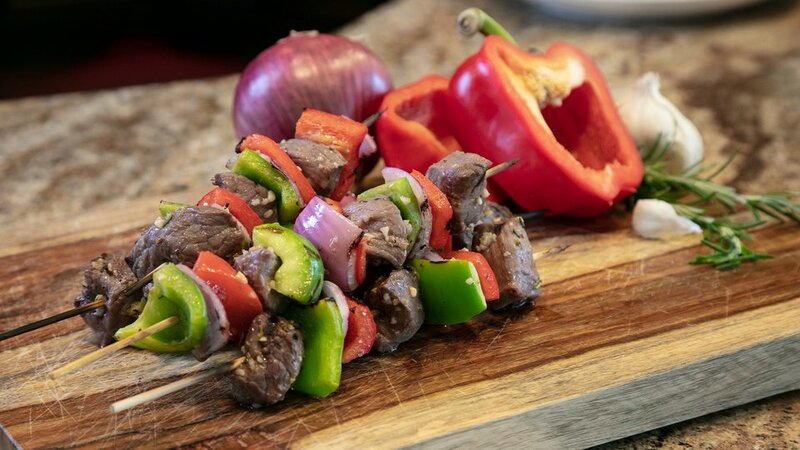 Place on skewers, alternating cubes of lean beef with bell peppers and onion. Place on the grill and cook for 2-3 minutes per side. Note: Soak 8 bamboo skewers overnight.